We Received The First Copies of Our d.i.y. Quantum Physics Book! Today we received the first two copies of our new book! It is a do-it-yourself book on Experimental Quantum Physics, and was published by John Wiley & Sons. “Build an intuitive understanding of the principles behind quantum mechanics through practical construction and replication of original experiments. 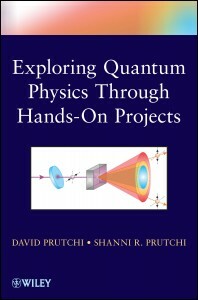 With easy-to-acquire, low-cost materials and basic knowledge of algebra and trigonometry, Exploring Quantum Physics through Hands-on Projects takes readers step by step through the process of re-creating scientific experiments that played an essential role in the creation and development of quantum mechanics. From simple measurements of Planck’s constant to testing violations of Bell’s inequalities using entangled photons, Exploring Quantum Physics through Hands-on Projects not only immerses readers in the process of quantum mechanics, it gives them insight into the history of the field—how the theories and discoveries apply to our world not only today . . . but also tomorrow. 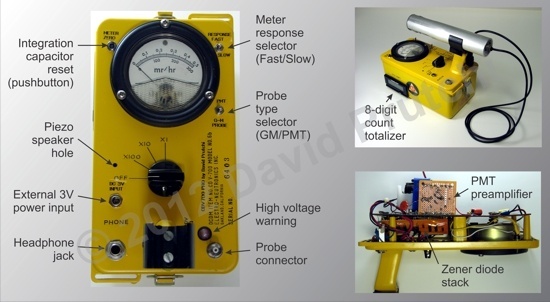 We modified a surplus Civil Defense V-700 radiation survey meter made by Electro Neutronics Inc. (Model 6-b) into a very capable radiation counter capable of working with both Geiger-Müller and PMT scintillation probes. We modified the front panel to accommodate the new switches, connectors, and panel light. In addition, we placed a Veeder-Root count totalizer module on the side of the box. The new electronic components, including a Zener diode stack and a PMT preamplifier are wired directly to the original printed circuit board.